Pryke Lambert Leathley Russell LLP is a limited liability partnership providing legal and business solutions to clients in select market sectors of the Lower Mainland. The firm's primary practice areas are real estate and development, insurance, personal services and business law. We work closely with our clients and deliver top calibre solutions in a timely fashion using advanced technology. 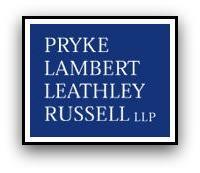 At Pryke Lambert Leathley Russell LLP, we organize our work into distinct practice groups. This organization lets us focus our skills and energies and you reap the benefit of concentrated effort. Our practice groups give you a wide range of legal services: pick and choose services from these groups to meet your needs.